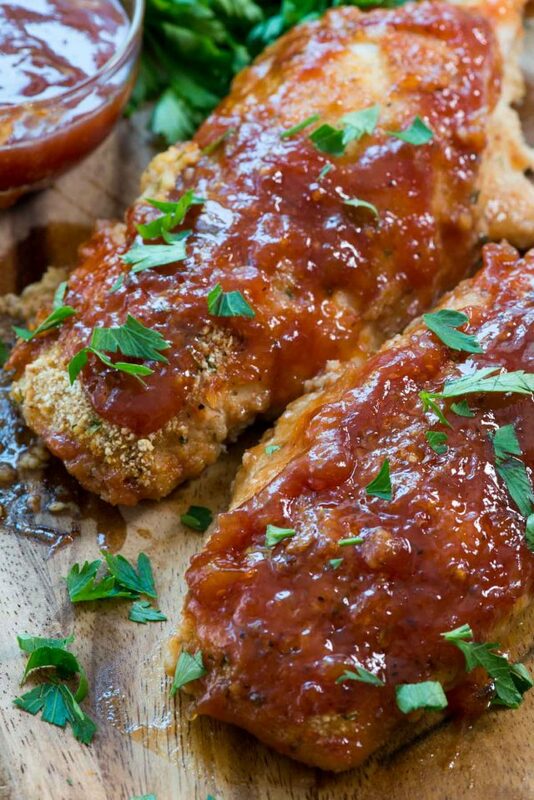 Easy Oven Baked Chicken Tenders are the perfect easy dinner recipe. These are baked in the oven so they’re healthier than fried, but they’re crunchy and full of flavor. If there is one thing I can count on Jordan to eat that’s not pizza or grilled cheese, it’s chicken tenders. We call them “chickens” in my house, as in: Jordan do you want chickens or a sandwich for lunch? Most Friday nights I don’t feel like cooking so Mel runs to our neighborhood specialty grocery where they sell prepared foods. One of our favorites are the chicken tenders (AKA “chickens”) but they’re fried so not super healthy. I decided I wanted to make an at-home version of our favorite chicken tenders, and I wanted them to be oven baked but crispy, like those fried ones we love. This easy chicken tender recipe is made in the oven but they come out crunchy because of the breading. 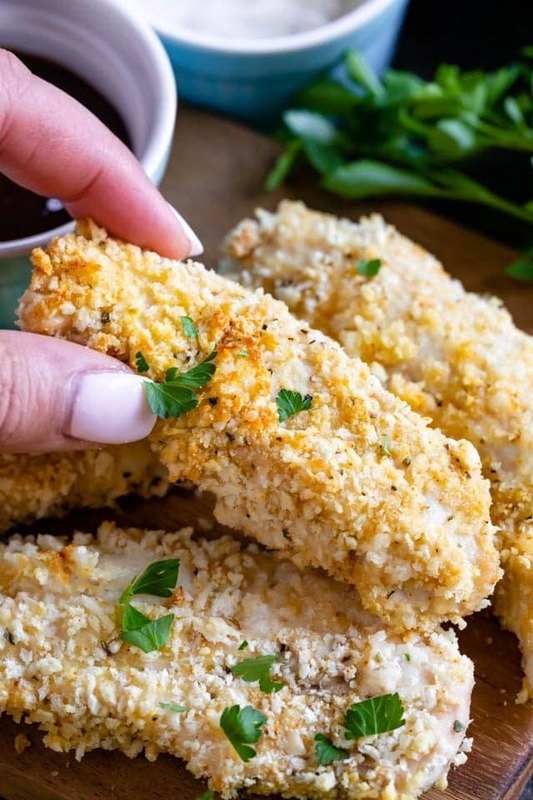 Every layer of the coating is seasoned so they’re super flavorful and they’re the perfect oven-baked alternative to fried chicken tenders or chicken strips. 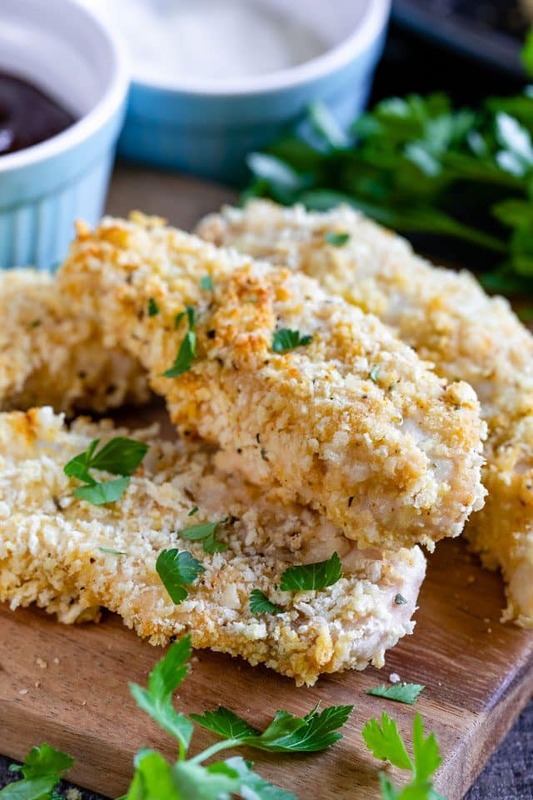 Easy Oven Baked Chicken Tenders are the perfect weeknight meal, done in under an hour. All the kids will love these too, even the picky eaters! For my chicken tender recipe I use chicken breast tenders. I like to buy them as tenders, but you can certainly just buy boneless skinless chicken breasts and slice them yourself. I find that the chicken tenders I buy taste better and have a better texture than slicing myself (plus I hate handling raw chicken). These are truly crispy, like a fried chicken tender, but they’re oven-baked so they’re much healthier than the alternative. And you won’t miss that oily coating, I promise! 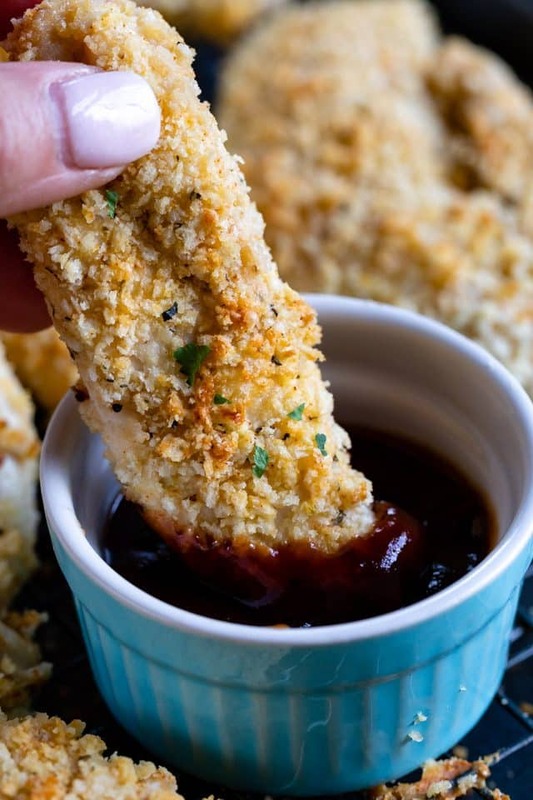 The secret to making oven baked chicken tenders juicy and crispy is the coating. I love using Panko breadcrumbs in this recipe. Panko is a Japanese-style breadcrumb that’s a bit lighter and fluffier than a traditional breadcrumb. 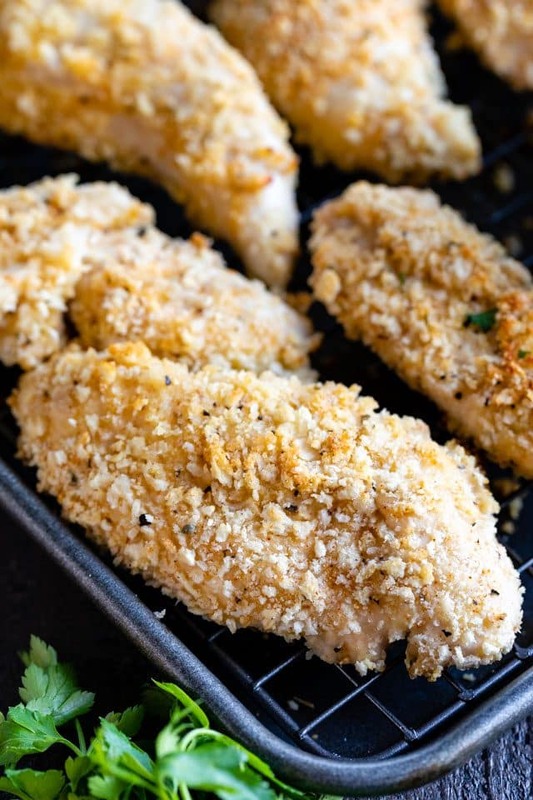 Coating chicken tenders with panko ensures a crispy crunchy coating, but you can use regular breadcrumbs if you prefer. How do you make sure that your chicken tenders are flavorful? 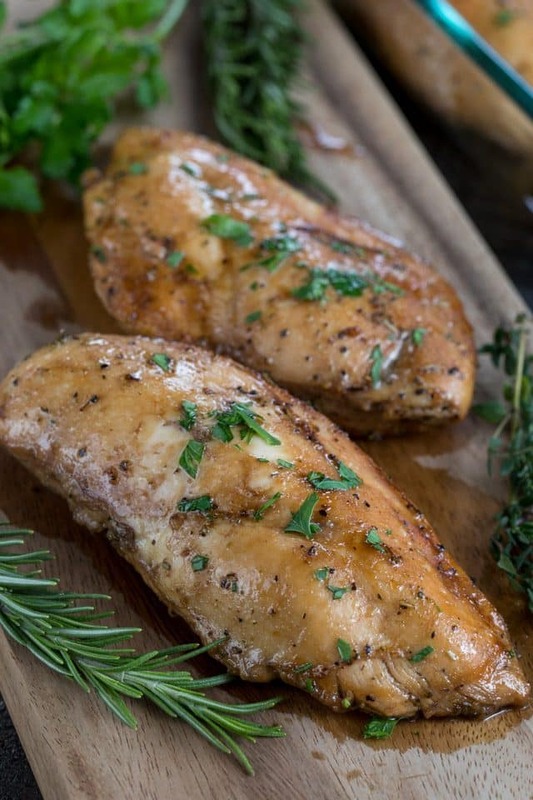 The secret to flavorful chicken – no matter how you make it – is making sure to season every layer. Back in the day I used to watch Rachael Ray’s 30 Minute Meals show. She taught me that seasoning every layer of your food is the key to success; that is, season as you cook, not just at the end. I season my Panko with garlic and onion, salt and pepper and other spices, but I also stir those same spices and flavors into the flour. That way your chicken will have seasoning in every bite. Keeping chicken tenders crispy during baking is done by using a rack. That’s right: the key to baking chicken tenders and keeping them crispy so they taste fried (but aren’t) is using a rack on your baking sheet. I highly suggest getting a rack for your roasting pan (or a jelly roll pan set that comes with a rack). Baking chicken tenders straight on the cookie sheet will either keep them soggy on one side or ensure that the coating peels off when you flip them. Baking on a rack allows the heat to circulate and create a crunchy coating on all sides. My other browning secret for chicken tenders: spray the tenders with nonstick cooking spray when you put them in the oven and then again when you flip them. 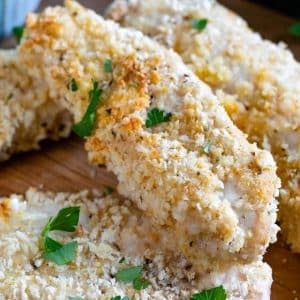 Oven baked chicken tenders are done in about 40 minutes, give or take depending on the thickness. Flip them halfway through baking, then serve with your BBQ sauce or ranch for dipping. The kids love these and everyone will love how much better they are than those fried chicken tenders we are used to heating and serving. Season all your coating layers. Use panko instead of traditional breadcrumbs. Bake them on a rack. Spray them with nonstick cooking spray for browning. 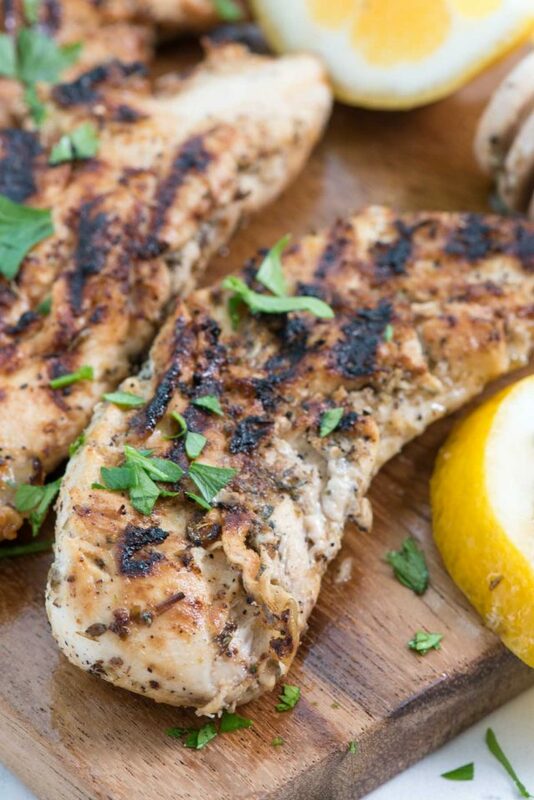 Use an instant read thermometer to ensure juicy cooked (not dry or pink) chicken. Chicken Tenders are so good baked in the oven; they're still crunchy and they're the perfect easy meal. Preheat oven to 400°F. Place a rack on a rimmed baking sheet. Place flour in a shallow dish. Add 1/4 teaspoon EACH salt, pepper, garlic powder, onion powder, smoked paprika and Italian seasoning to the flour and stir. Place egg, water, and dash of hot sauce in a second shallow dish. Whisk to combine. Place panko, parmesan, 1/2 teaspoon EACH salt, pepper, onion powder, garlic powder, and Italian seasoning and 1/4 teaspoon smoked paprika in a third shallow dish and stir to combine. Dip each chicken tender in the flour, then in the egg, then in the panko to completely coat. Place on prepared pan. Spray the tops with nonstick cooking spray. Bake 20 minutes, then flip the tenders and spray again. Continue baking until they're cooked through to 165°F (about 15-20 minutes more). Serve hot with ranch or bbq sauce or mustard for dipping.